Odysseyware, a curriculum resource by Glynlyon Inc., offers approximately 200 courses for students in grades 3-12 on its Odysseyware website. The content is made up of curricular materials in a variety of formats and media, as well as chapter quizzes and optional projects, including virtual labs and unit exams. These courses were reviewed in consideration for a Seal of Alignment. The course offerings are made available via a Learning Management System (LMS) that also includes a teacher interface that enables educators to create classes, organize materials, customize courses and create grade and other reports based on student activity. The courses in the LMS platform are also searchable by alignment to state, common core and Next Generation Science Standards (NGSS) frameworks. 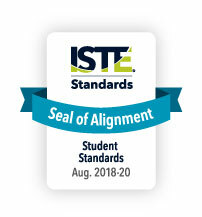 22 courses reviewed by ISTE and aligned to the ISTE Standards for Students. Online curriculum for public, virtual, charter and alternative schools. Career, technical, elective and core courses. Odysseyware instructors available for most courses. A selection of 22 courses focused on technology and STEM topics from the Odysseyware curriculum successfully underwent the International Society for Technology in Education (ISTE) Seal of Alignment review for Proficiency. Reviewers determined the courses reviewed provide an opportunity for students to practice the skills and knowledge described in the ISTE Standards for Students. “This is an impressive set of incredibly dense courses designed to be adaptable to a variety of audiences and settings, and aligned extensively to the ISTE Standards for Students." 2.d. Manage their personal data to maintain digital privacy and security and are aware of data-collection technology used to track their navigation online. 5.a. Formulate problem definitions suited for technology-assisted methods such as data analysis, abstract models and algorithmic thinking in exploring and finding solutions. 6.d. Publish or present content that customizes the message and medium for their intended audiences.